Russell Crowe was spotted on set during the filming of his latest role as Fox News’ Roger Ailes and he was one-hundred percent unrecognizable. The 54-year-old actor had little-to-no hair and donned a charcoal-gray, pinstriped suit with a purple tie as he walked down the street while holding a cane in a photo shared Tuesday by TMZ. 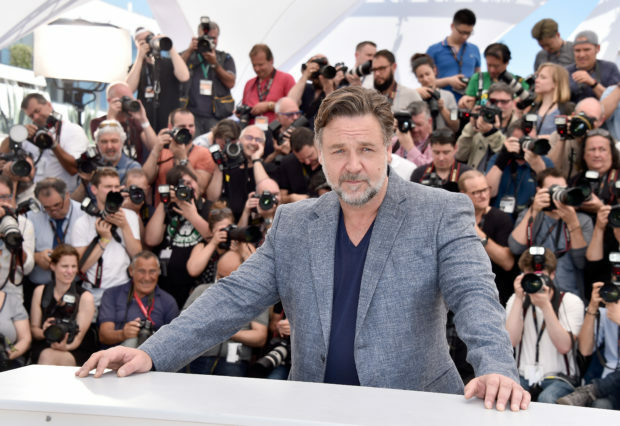 The caption next to the picture read, “Russell Crowe is pulling a Christian Bale by fully immersing himself in his role as late Fox News chief Roger Ailes, and doing such a great job at it, you’d never recognize him on the street. Crowe was cast for the part in Showtime’s new limited series that started shooting this week in New York City. It centers around the late news network founder’s life and the sexual harassment allegations that surfaced against him in 2016 that lead to him leaving, according to People magazine. The series will be based on the book, “The Loudest Voice in the Room” by Gabriel Sherman who interviewed more than 600 people for the book. “In revelatory detail, Sherman chronicles the rise of Ailes, a frail kid from an Ohio factory town who, through sheer willpower, the flair of a showman, fierce corporate politicking, and a profound understanding of the priorities of middle America, built the most influential television news empire of our time,” a part of the description about the book reads on Amazon. “Drawing on hundreds of interviews with Fox News insiders past and present, Sherman documents Ailes’s tactical acuity as he battled the press, business rivals, and countless real and perceived enemies inside and outside Fox,” it adds, in part. Ten months after Ailes left the network, he died at the age of 77 when he suffered an injury in a fall and died from complications related to the accident.